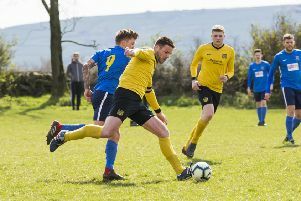 Brighouse Town begin a season-defining two weeks of action as they prepare to face third-placed Tadcaster Albion on Saturday. Vill Powell’s side travel to Albion in good form following a resounding 4-1 win over Lincoln United last weekend. On Tuesday they drew 0-0 with Ossett United in the West Riding County Cup before being knocked out on penalties. Brighouse follow their game at Tadcaster with a trip to the world’s oldest football club, Sheffield FC, before hosting table toppers Morpeth Town on December 15. “It is the start of a big few weeks for us,” said Powell. “It would have been nice to have gone through in the cup but our main focus and our priority is the league. “We are going into a run of really big games with important points up for grabs. Powell feels that Tadcaster will provide his players with a sterner test than Ossett on Tuesday evening. The Brewers, who had a poor start to the season, have hit form in November. The Michael Morton and Simon Collins managed side are in third position, narrowly ahead of Town on goal difference after three victories and a draw this month. They drew 1-1 with AFC Mansfield and have seen off Belper Town 3-1, Stamford 3-0 and last Saturday scored an 89th-minute winner at Spalding United. “We will be going there knowing that we will have to be right on our mettle and be clinical if we want to get the win,” said Powell. “Our next three games are against teams that are all in the mix, they are all top teams. “If we want to stay in the mix we have to pick up the points in these games. “It will come to a point where we come to a crossroads where you are either going for the top or you are going for mid-table. That will be decided over the next month. Powell has no fresh injury worries from Tuesday’s clash at Ossett and is hopeful that Gabriel Johnson will be available for selection. On Saturday afternoon, Brighouse showed great resolve to come from behind and claim a hugely-important 4-1 victory against Lincoln United. Matthew Wilson had given the visitors the lead a minute into the second half. Brighouse hit back three minutes later through Adam Jones before Mohammed Ibrahim put Town in front. Goals from Adam Field and Tom Robinson sealed it.